Creative Cloud sure did change everything Adobe – and not all for the better! 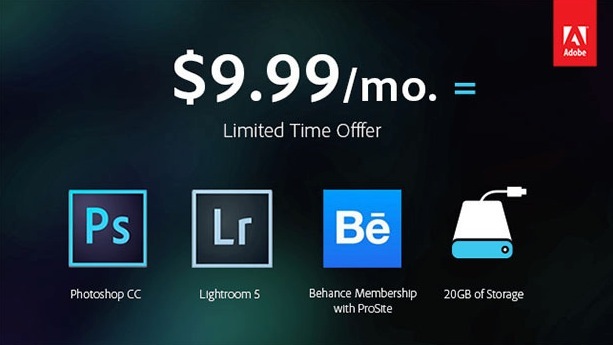 – At $9.99 (plus tax) a month for Photoshop and Lightroom, financially this is certainly a benefit – unless you upgrade only every 2-3 years or so. At $120 a year this is a pretty good rate – especially considering the upgrade to Lightroom is $79. The last time I upgraded Photoshop – to CS5 – it was $199. Even if you used to upgrade every couple years it is now pretty much a wash regarding the overall amount of money you spend with Adobe. – If you are like me and waited until the end of August to start our $9.99 one application subscription offer, according to a FAQ posted on Adobe we will be automatically transitioned into the new Photoshop program. – again according to those FAQ’s the $9.99 price will supposedly stay with you forever (I guess as long as they consider it the “standard price for this level of membership”) as long as you keep sending Adobe those monthly checks. – The biggest problem still is if you end your subscription you won’t have access to your Lightroom library anymore unless you own a standalone version (and assuming the older standalone version is compatible with the current version – which usually is not the case). So stop paying your monthly fees to Adobe, and say goodbye to the Lightroom catalog you have been spending years updating. Start paying Adobe again and your catalog is back to being able to be used. What Ben said is exactly why many pros skip an upgrade version or 2 every time a new Photoshop or Lightroom upgrade is out, and why I feel Adobe really went to the subscription model. – If you are in particular a Lightroom user I would still be cautious moving towards the subscription model until Adobe addresses the issue of how you can access your catalog should you decide to stop paying Adobe monthly. Your catalog won’t be compatible with older versions of Lightroom you may have. Your only recourse would be to export all of your photos and metadata while you still are subscribed and take the time to reimport all of that info into another program like Capture One Pro. While you will retain all caption info, starred photos and any photo settings you made will not transfer over. What I would love to see Adobe do is make an offer that, say after 1 year of subscriptions if you decide to leave you will be able to take with you a stripped down version of Photoshop and Lightroom that will at least grant you access to your catalog and export files and allow some basic editing. Not feeling like you are so locked into a program will certainly improve the current feeling many photographers now have towards Adobe. Still not convinced Adobe CC is for you? I don’t blame you. If you are looking to replace Lightroom, I couldn’t recommend Capture One Pro enough. I used to use it before Lightroom came out and recently went back to it after saying goodbye to Lightroom. I am glad I went back too, as I feel it is a much better program than Lightroom. Want to replace Bridge? Who doesn’t actually? I have never been a fan of Bridge – it is slow and a resource hog. Camera Bits makes Photo Mechanic. I used this program almost since it debuted many years ago up until 2005. I just upgraded to the current version and love it! Looking to move away from Photoshop? Well you can still purchase a standalone version of Photoshop Elements – which may suffice for many. I would definitely recommend however taking a long serious look at onOne’s Perfect Photo Suite 8 that was just announced yesterday. Called “The Photographer’s Choice for Photo Editing” this software can replace Photoshop for many, many users. I use it regularly and just like Capture One Pro I couldn’t recommend it enough. What are your thoughts on the new Adobe Photoshop Photography Program? Has Adobe done enough damage control for you to now give it a go? Did you always like the subscription model? Are you still just as mad at Adobe? Still not happy, I’ll do whatever I can to avoid CC and any software rentals, even continue to run CS2. Introductory offers are always a scam to pull you in. There’s no reason to believe they won’t jack up the price in the near future. Adobe is looking more like the cable tv company. We’re planning on avoiding CC as long as possible. I want to know that I’ve got the software on my computer to access my files. It is a very legit concern Patty. Files from Photoshop would be compatible (unless Adobe comes out with a proprietary format) but your Lightroom catalog would only be visible using the current version of Lightroom and if you stop your subscription you will loose access to that catalog with all of the data stored in it. You’re right about onOne’s Perfect Photo Suite. I’ve been using it more and more, and not going into Photoshop so much. I think it’s easier for compositing. But it won’t run on my laptop due to a video processor issue. However I have my files on a external network drive through a USB port on my router, so am able to work on the laptop til I need to go to onOne’s programs, then move on to my desktop for final processing, which I used to do most of the time anyway because the desktop is much faster. But folks need to be aware of the video processor issue. Tom – I have had some trouble on my 27″ iMac – it is quite a few years old now – maybe 5 years – a 2.66 GHZ Intel Core i5 – and I definitely experience a slowdown running onOne with more than a few layers. Sometimes I will just open the layered photo in PS to finish painting masks. Waiting for the new Mac Pro workstation that is supposed to be coming soon.